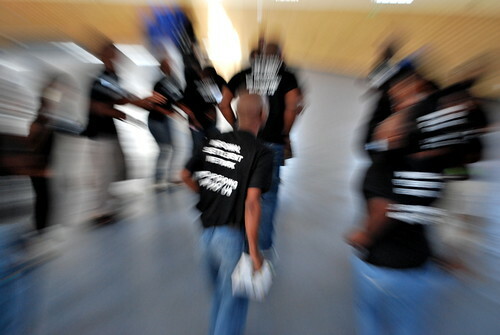 On Thursday 23 February 2012, while South Africa were debating the implications of Finance Minister Pravin Gordhan’s budget speech, another group was preparing to put action to words. 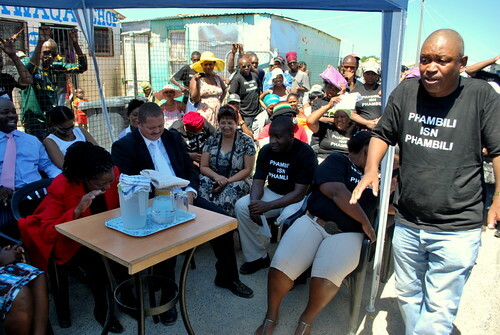 Community leaders from across the country and associated with the Informal Settlement Network (ISN) were gathering in a community hall in Joe Slovo Park, Milnerton, Cape Town. This group attended a workshop during the week on enumerations, mapping and blocking out of their settlements. The energy was bouncing off the walls, and detonated into a joyous singing-dancing affair along Freedom Way. 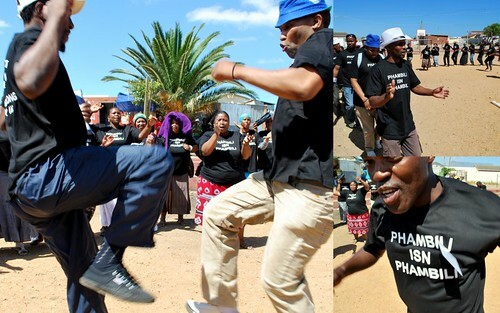 The group danced and sang their way to the next stop: an open field in Mshini Wam settlement where a gazebo was set up to receive the Deputy Minister of Human Settlements, Ms. Zou Kota-Fredericks. The group sang affectionate songs to the on-lookers, urging them to unite and prepare their communities for improving their living conditions. 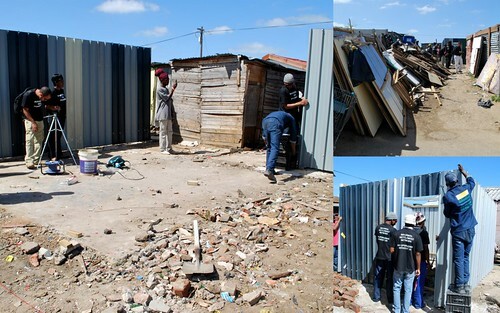 Blocking-out is a term the South African SDI Alliance uses to refer to the community based planning and design processes that lead to the re-organisation of shacks to utilise space much better. 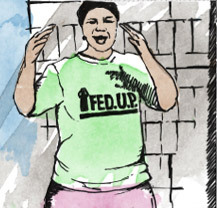 The need for blocking out could be anything from opening space to ensure better penetration of emergency services, finding solutions to flooding and fire, security and safety of children in court yards under neighborhood supervision, or better located water and sanitation services. 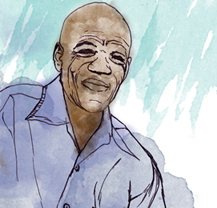 In the case of Mshini Wam – a settlement that has been plagued with fires that not only destroy their belongings, but also have claimed residents’ lives – the community intends to open space to develop roads for emergency services, amongst others. Ms. Kota-Fredericks was led through a narrow alley way littered with the debris of shacks pulled down. However, in the place of the old: the new! 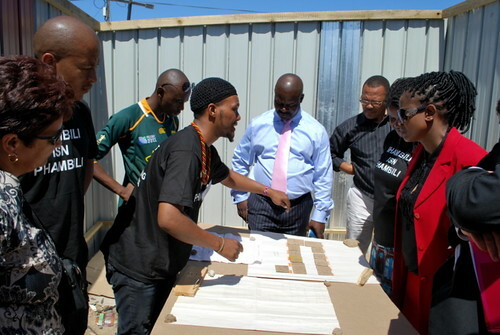 Ngcambo, a leader from Mshini Wam, introduced the community designs to the minister in a practical way. He presented the previous layout of shacks with cardboard cut-outs, and rearranged them to show her what the new layout will look like. 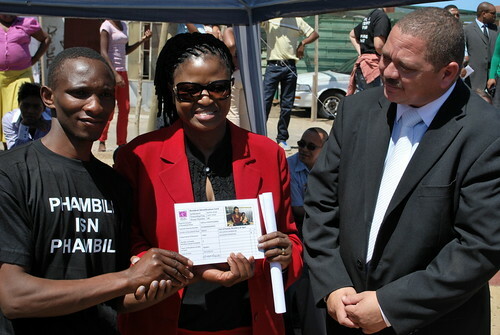 The iKhayalami team was supporting the affected households on that very same stage, and the minister could see the new synergy of professional builders working alongside unskilled communities. The skills transfer that occurs in this space is notable. This small gesture goes a long way. When the City’s anti-land invasion unit peruses settlements, and allegedly threatens with eviction, residents in enumerated settlements can easily produce tangible evidence to the contrary. The party then moved on the next venue: Siyahlala settlement across the road from Mshini Wam. “It’s an honor to again have you here amongst the shacks, Minister” said Patrick Magebhula, chair of ISN and advisor to Tokyo Sexwale. “This is where it really matters”. Turning to the buzzing crowd he said, “You need to be a leader with a purpose. A leader that represents solutions to real problems. A leader of the elderly, of the unemployed, of the disabled, of the children. And you will only know your people and your settlement if you have enumerated and discussed the data”. Magebhula also ensured the Minister and officials from the City of Cape Town that ISN, with support of CORC, are preparing a master database of data collected in settlements over the past years. Increase public support for municipal activities and local understanding of municipal development needs and constraints. 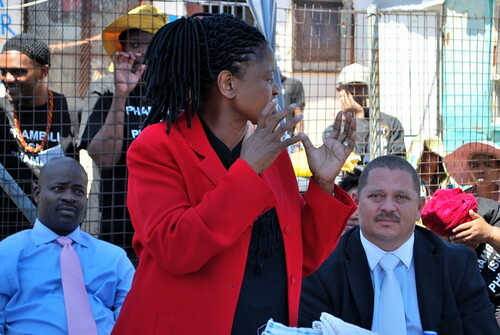 Minister Kota-Fredericks reminded the delegation of minister, councillors and officials that these are the people we serve. She further remarked that the Department is in the process of finalising its budget and at the budget speech, she will report back on the collaborative upgrading initiatives she witnessed in Cape Town. In closing, minister Kota-Fredericks talked about the “multiplier effect” that small City-wide projects have on national policy deliberations. This starts through organised communities taking the initiative to build horizontal networks of accountability and transparency. Only by building partnerships with all tiers of government, starting at the local level, meaningful engagement will be achieved. The minister walked the talk, and conducted a household level enumeration by completing the CORC questionnaire with a local resident. 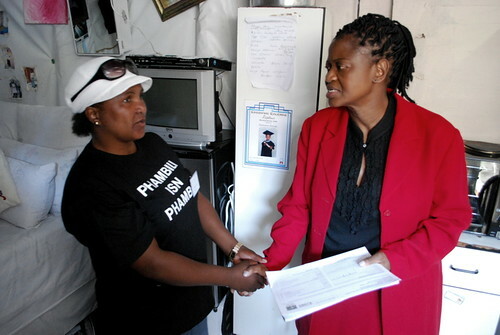 And in doing so, she also launched the enumeration of Siyahlala settlement.